CHICAGO (January 16, 2014) — In its 29th year of honoring the nation’s best high school athletes, The Gatorade Company, in collaboration with USA TODAY High School Sports, today announced Curt Knight of Jackson Academy as its 2013-14 Gatorade Mississippi Boys Cross Country Runner of the Year. 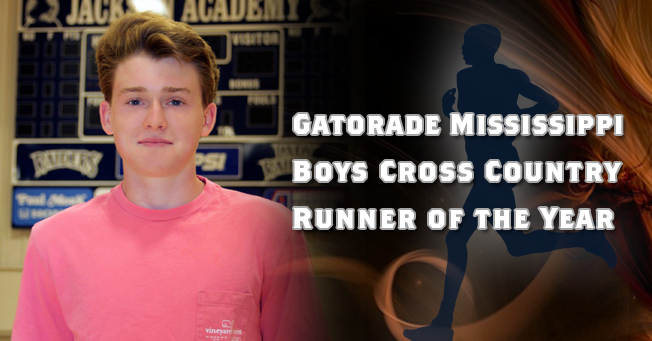 Knight is the first Gatorade Mississippi Boys Cross Country Runner of the Year to be chosen from Jackson Academy. The award, which recognizes not only outstanding athletic excellence, but also high standards of academic achievement and exemplary character demonstrated on and off the racecourse, distinguishes Knight as Mississippi’s best high school boys cross country runner. Now a finalist for the prestigious Gatorade National Boys Cross Country Runner of the Year award to be announced in January, Knight joins an elite alumni association of past state award-winners in 12 sports, including Ryan Hall (1999-00, 2000-01, Big Bear HS, Calif.), Derek Jeter (1991-92, Kalamazoo HS, Mich.), Candace Parker (2001-02, Naperville Central HS, Ill.), Kevin Garnett (1992-93, Maudlin HS, S.C.), Abby Wambach (1997-98, Our Lady of Mercy, N.Y.) and Mark Sanchez (2004-05, Mission Viejo HS, Calif.). The 5-foot-11 junior distance runner raced to a third consecutive Mississippi Association of Independent Schools Class AAA individual state championship with a time of 16:15.70 this past season, leading the Raiders to second place as a team. A three-time MAIS Class AAA First Team All-State selection, Knight captured 100th place at the Foot Locker South Regional championships in 15:56, clocking Mississippi’s fastest 5K run of the fall. Knight has maintained a 3.60 GPA in the classroom. An Eagle Scout in the Boy Scouts of America, he has volunteered on behalf of his church’s youth group and at a local soup kitchen. Knight will begin his senior year of high school this fall. Knight joins Gatorade Mississippi Boys Cross Country Runners of the Year Will Murphey (2012-13, Oak Grove High School), Jordan Travis (2011-12, Poplarville High School), Chad Moore (2010-11, Oak Grove High School), and Max Holman (2009-10, 2008-09, & 2007-08 Tupelo) as athletes who have won the cross country award since its inception in 2007.